Sound familiar? If so, you may have read my recent post about connecting your computer or other device to the Internet using the connection provided by your Android phone via a method called USB tethering. Today we will focus on Wifi tethering, a different method I mentioned in that same post. Before we start though, what is WiFi tethering? 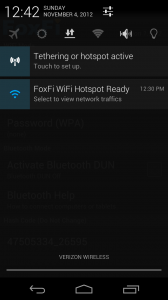 WiFi tethering is different from USB tethering in that you do not need to connect your phone to your other device with a USB cable; instead, your phone sort of acts like a router that broadcasts the signal wirelessly, allowing you to establish a connection like you would when connecting to a dedicated WiFi network. 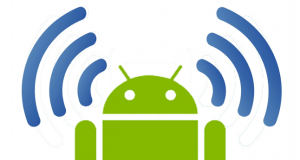 To do so is quite simple and does not require you to root or modify your phone in any other way. All you need to do is download and install one app! 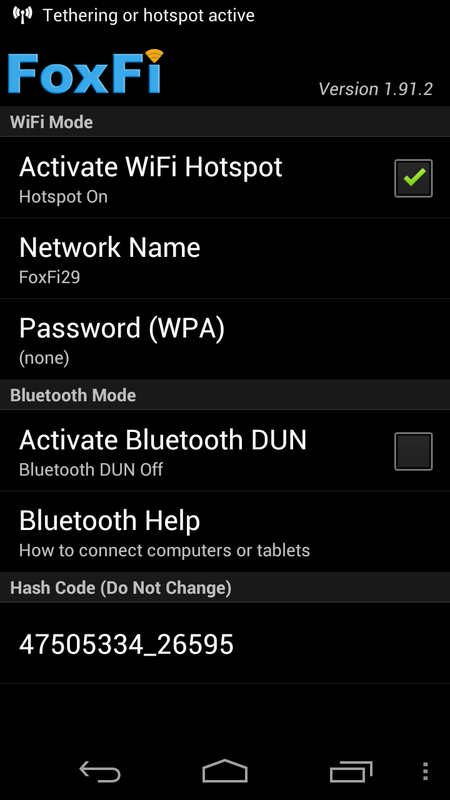 FoxFi, available for free on the Play Store, is the app I will use to demonstrate how to use your phone as a WiFi hotspot. Unfortunately the app description indicates that WiFi mode in FoxFi does not function on certain phones. On the bright side, Bluetooth mode, which transmits the Internet connection via Bluetooth instead of creating a WiFi hotspot, seems to function on all phones. For those of you who may own one of the phones listed in the description, I will cover Bluetooth mode too! All you need to do is select the box next to “Activate WiFi Hotspot”, the first option under “WiFi Mode”, and then wait for the app to do what it needs to do. You will receive two updates in the status bar while the app is working. 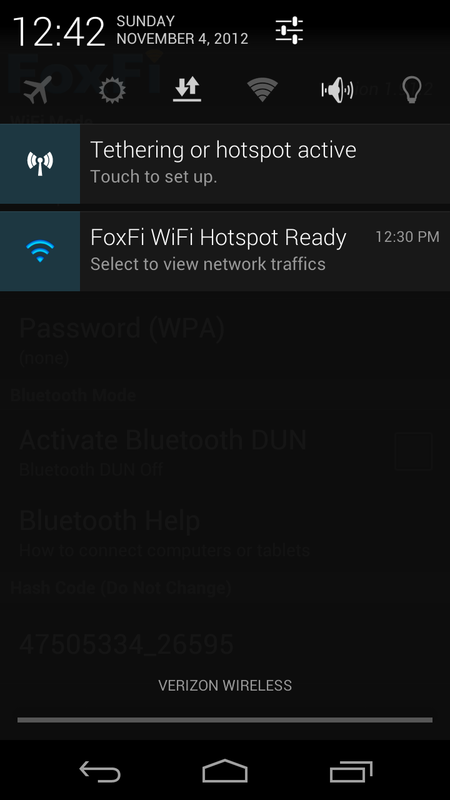 Once it finishes, FoxFi will push two persistent notifications to the status bar that prompt you to perform additional setup or view network activity, but you can do everything you need to do in the app itself after the initial activation. The first item on the agenda is changing the network name. Now if you happen to be at home and you are the only person using the hotspot, then you may not need to do so; but if your friends and family want to use it or if you are in a setting where multiple WiFi networks are available, then changing the default name to a more unique one can be beneficial for identifying the network easily. Next, regardless of your location, you should create a password. Creating a password ensures that the hotspot is protected from unauthorized access, whether it be from strangers who have no business using your Internet connection or malicious individuals seeking to hijack the connection for illicit purposes. After you complete those two small tasks, open the appropriate menu on your laptop or tablet and look for the network name you created. Select it, enter the password you created, and that should do it! For additional options like enabling a proxy to hide tether usage from your carrier (which requires a bit of additional configuration in your browser settings) or sending logs to the developer, FoxFi also provides the free FoxFi AddOn. An option to install the add-on appears in the menu in the app itself. Subsequently the extra options from the add-on appear in the menu once you have installed it. Now onto Bluetooth mode! Again, not much is required in the way of setup. 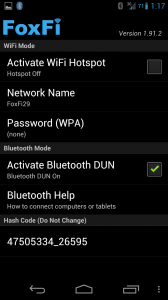 Simply select the box next to “Activate Bluetooth DUN”, the first option under “Bluetooth Mode”. 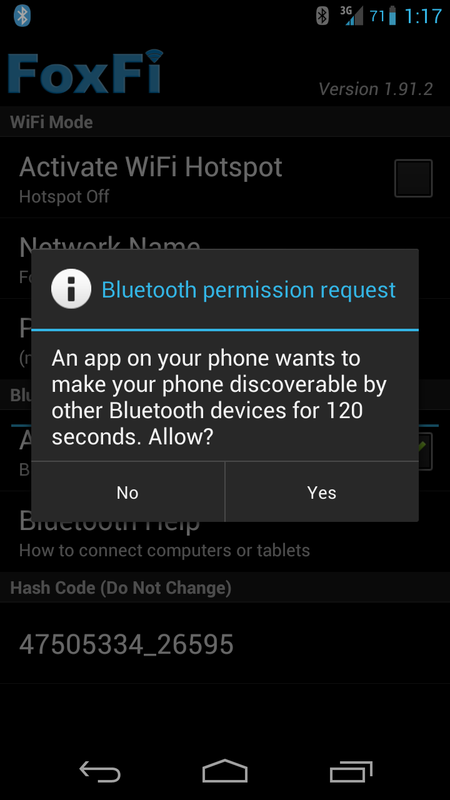 If you have not already turned Bluetooth on in your phone settings, the app will do it for you or prompt you to do so. 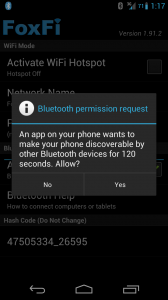 Once Bluetooth is on, the app will prompt you to make your phone discoverable by other Bluetooth devices for a duration of 120 seconds, allowing you time to ready your laptop or tablet to connect. 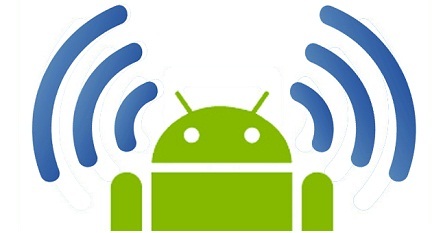 And now you know how to use your Android phone as a wireless hotspot without paying anything additional to your carrier! If you have any other categories you would like us to tackle, any apps you would like us to review, or any lessons about Android you would like to learn, please let us know in the comments. Thank you for reading! Matthew Serre is a young professional with a passion for activism, Android, cooking, gaming, music, painting, rhetoric, social justice, technology, and volunteering. If I don’t have Bluetooth on it tells me HTC phones have a hotspot lock? 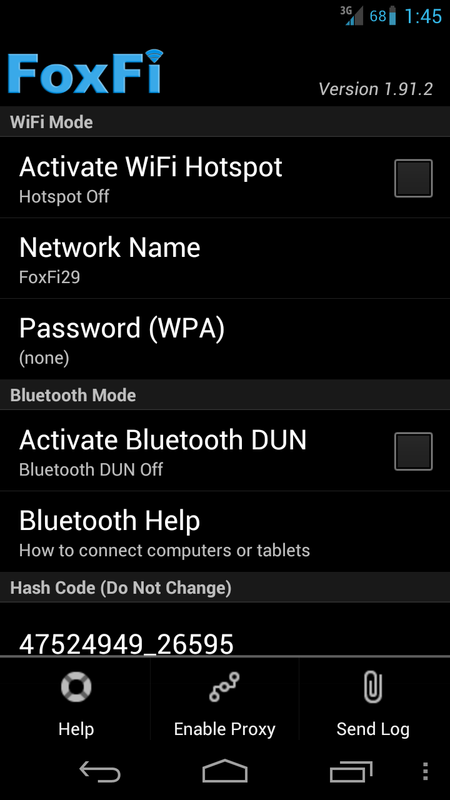 And when I turn on Bluetooth and try to activate it my phone tells me to turn off the Bluetooth option.I’m confused. 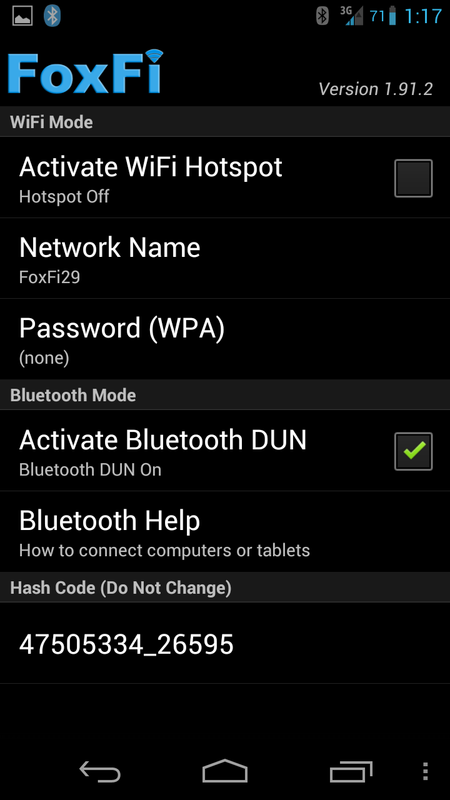 When trying the Bluetooth method, have you deactivated the WiFi mode and activated the Bluetooth mode in the app? Let me know so we can try to figure it out! Super article, but what do you do with the message, “This item is not available on your carrier,” when you attempt to install the app? Carriers often prevent their customers from using tethering functionality other than that which is built into the phone so that they must pay the carrier additional fees to use the service. Without rooting your phone, you will probably not have access to tethering functionality. Nevertheless, what carrier and phone do you have? I may be able to find a workaround that still lets you do it. Great find John, I was able to install the app. Steps I took: download app as you suggested, copy to phone, turn off security that only allows installs from Play Store and I appear to be in business. Haven’t tested yet, might need to wait till next billing cycle. I was looking into this for a client, now at least I can sound somewhat knowledgable. Also Matt, I have a Galaxy S i897 Captivate on ATT. Also running Gingerbread 2.3.5, not sure I can run anything more advanced safely. Did this ever show up on your sprint bill? I have sprint and am looking to “hotspot” without rooting. Thanks in advance! Alternatively, have you received and installed the update for your phone that upgrades it to Ice Cream Sandwich (Android 4.0)? The app description says FoxFi works with HTC phones running Android 4.0 or later; if you have not upgraded the operating system version of your phone from 2.x to 4.0, you should do that and then try again. Does all of this uses data? Indeed, using your phone as a WiFi hot spot counts against the date cap you have on the mobile data connection provided by your carrier. Just be sure to monitor your usage so that you don’t go over. Still saying that my plan doesnt support this and turns it off. I have a rooted Sprint S3. Is there a certain ROM I need to install? 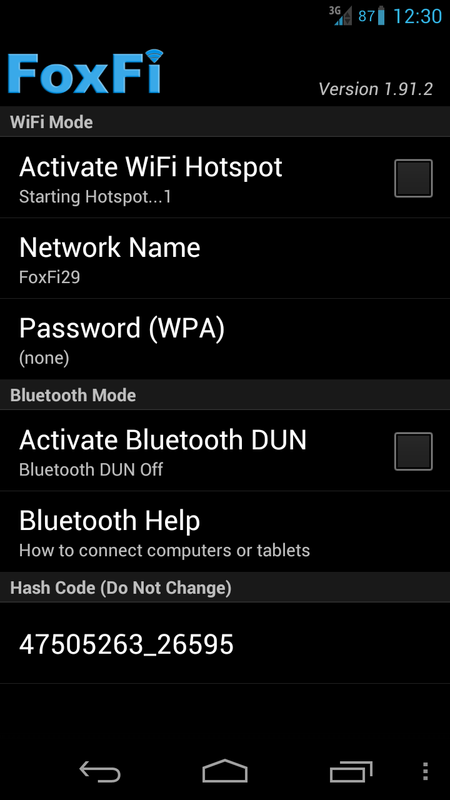 The description for FoxFi indicates that it does not work on some devices with Jelly Bean and is not tested to work on rooted phones, so it may not work for either of those reasons. Otherwise, Sprint apparently frowns on the practice of tethering because of their censorship of FoxFi on the Play Store, so maybe there is something else at play that prevents it from working. In general, I would recommend trying a CyanogenMod build, which features built-in tethering that will likely work. I hope this helps. Thank you for reading! I have a Mytouch 4g slide U8730, T Mobile. When I hit “activate WiFi Hotspot” I get the following message “fail to activate hotspot: wifi mode has ailed on your phone. Please use USB mode or Bluetooth mode instead”. I was successful with the USB tether to my laptop but I want the hotspot for my iPad. What can I do? As per the app description on the Play Store, WiFi mode does not work on most HTC phones. 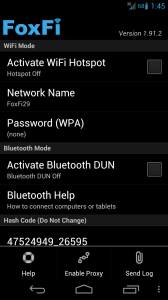 I recommend trying Bluetooth mode instead if your device supports it. Otherwise, you may want to search for other WiFi tethering apps to see if there are ones compatible with your device. I hope this helps! Thank you for reading! Just my luck!! Thanks again for your help!! Silly auto correct…the message is supposed to read ” WiFi mode has FAILED on your phone” Sorry! Hi Matthew, I need some more help. While you suggested dropbox for transferring files from pc to my Samsung Galaxy Tab, I did install it and it does work. However, with the Samsung Tab i have a program Kies, which I transferred some music ok. Have done some pics too, but on the Tab I cant see how to actually make my own album of particular photos, samsung seems to decide!!! I recently transferred pics from my camera, to pc, and then from pc with Kies to the Samsung Tab,having the pics in folders, but the photos have gone in with other non relevant pics into “Camera”on the Tab in the “Gallery”. Any idea how I can move photos from one album to another or make a new album, Cant see anything in the Tab that will let me do it. Even renaming the pics didnt help. Maybe other Samsung Galaxy Tab users may have some idea. Tnx again. Wade I am not following you. Can you give more detail how you did that. I have a toshiba thrive tablet with pdanet and a droid razr with pdanet+ foxfi installed right now because of jelly bean can only use bluetooth connect. are you saying you can hotspot wifi again? can you explain what you did? I believe Wayde means that he used an app that functions specifically to share apps with other people. Basically you would need to find someone who already has FoxFi installed and that person would have to use the app he’s talking about to share the app with you. Perhaps you could search to find a FoxFi .apk (.apk is the file extension for applications) and just download and install the .apk file. I believe previously FoxFi provided a direct link to the .apk on their website, but they seem to have merged with PdaNet, another tethering app. Trying downloading the apps from their website. I’m new to all this and i need to get a new phone plus a hotspot. This idea would be perfect. I’m wondering if there are certain phones through Verizon that has tethering will work with for sure? I recommend reading thoroughly the description of the app on its Play Store page to determine if there are any models it does or does not work with specifically. Also do some forum searches about the app working on any phone you might want to purchase to see if anyone else has had any issues or success. I’m with Rhonda, Wayde would like to know exactly what you did. I have a Samsung galaxy note 2 that I’m trying to get wifi teethering on. Would really like it broken down more Please? I would recommend trying an app like Solid Explorer, which allows you to view the various directories of your device to locate or move files. If you cannot manage to save a certain file to a directory directly, then perhaps you can at least move files to where you want them stored. I have a samsung gravity smart tmobile phone and I tried using the app that U recommend however when I try to connect to my laptop (which is a hp) it says ‘the default gatway is not available, or connection unsuccessful due to limited connectivity or limited access’. Next I tried to connect to my samsung galaxy tab 2 7.0 but when connecting it says ‘network disabled poor connection’. Am I doing Something wrong? Or should I try another app? I have a 3g connection and I have data on the account however it does not seem to be working. Please advise. It seems FoxFi has merged with PdaNet, so I recommend trying to download the newest version of the app if you have not done so already. Otherwise, sometimes devices are just not compatible with these apps. You may want to try other similar apps and see if you have better results. Is there anyway I can use my phone in this way with out using data, or is this impossible? I do 24 hour care over the weekends and where I am at there is no internet connection. I can however activate hotspot on my phone but I don’t want to use up my data. Unfortunately your phone needs a mobile data connection for the WiFi hot spot to function. Your phone basically just projects its existing Internet connection so that other devices can use it and connect to the Internet through it. This uses the data associated with your plan. Sorry it does not work the way you want it to work. Thank you for reading! hi Matthew, and thanks so much for your productive info. question for you: i have laptop with no problems. when i use my 4g metropcs smart phone the laptop is able to connect to it, and even update programs (windows7 and so on). it will open the explorer for me , but it just loadded without me see anything in that window. any ideas? also, i do use MY HOTSPOT. is the program you mention (foxfi) working on usb too? Hi, will this app work with Sprint ? So just a quick question, when it says “tethering or hotspot active” will my carrier know about it and will I end up getting charged more or is it ok to use and free now? Or am I supposed to turn it off and the app works without it. Thanks! Installed FoxFi…. My phone Provider does not support their phones to be used as a Hotspot. I installed FoxFi hoping I would acquire this feature. Bluetooth Paired find, but since its Video I want to stream from my phone to my Table….Bluetooth is of no use since it only is for Audio (if I am wrong, set me straight; when I pair and then open an App on my Tablet that will stream Video I get, cannot play Video). Something else I should be doing? 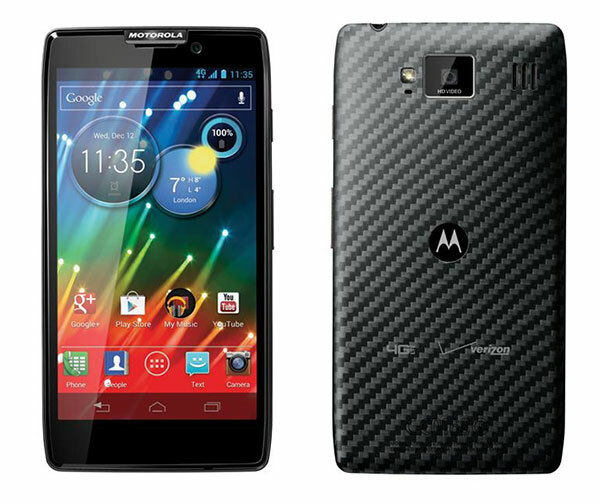 Will this work on Verizon with the Samsung Galaxy S5? I uninstalled the app and the credential but now the only screek lock I have is the pin lock. How do I get the others back? I just bought a Google Android 4.2 dual core 1.5GHz 7″dual camera Tablet PC. Leave a Reply to Mike Fisher Click here to cancel reply.